A couple of weeks ago I posted more than a dozen shorts that we have made at various protests over the years. I was prompted to revisit all of those pieces after finishing a short about all of the goings on outside of a Trump rally in Greensboro, NC. I’m now thinking of putting the work together as an exhibition. I want people to be able to move through them at their own pace – not locked together as a mini feature. Like so many other people, I have always found it important to document these events. 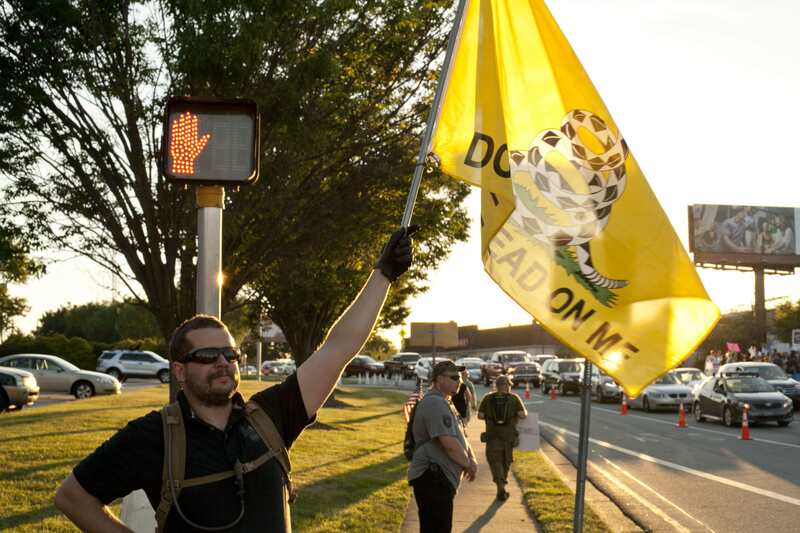 I thought about going to the RNC in Cleveland to shoot, but couldn’t get my act together – partly because I felt like I had captured that spirit at the Trump rally already – and partly because I just couldn’t even imagine it. I managed to get a plane ticket to New York so that I could attend the protests in Philly at the DNC. I wanted to go to Philly to document what the protesters were saying so that I wouldn’t have to try and explain it to anyone else. On the first day, I found a robust crowd in front of city hall. I filmed a bit with an old friend who had come from Prague five months earlier to get out the vote for Bernie. He was still at it. I then filmed a rally with speakers like Cornell West and Chris Hedges. We then marched from City Hall towards the Convention with Cheri Honkola’s Poor People’s Economic Human Rights Campaign. About halfway there a big chunk of the march staged a sit-in under a Mississippi flag. The police immediately made it clear that they would take down the flag, but it took a while and tempers started to fray. In 2000, I filmed at the RNC convention in Philly and the police were not nice. There were a lot of arrests. This year, the cops were doing everything they could to make things go smoothly. Eventually, they got a cherry picker to the flag and took it down. The march went on. When we arrived there was a wild mass of people with divergent viewpoints. They were either on the the left side of the dial politically, or religious zealots trying to save these infidels. It was an exhausting day and I could barely walk by the time I got back to my friend’s house. 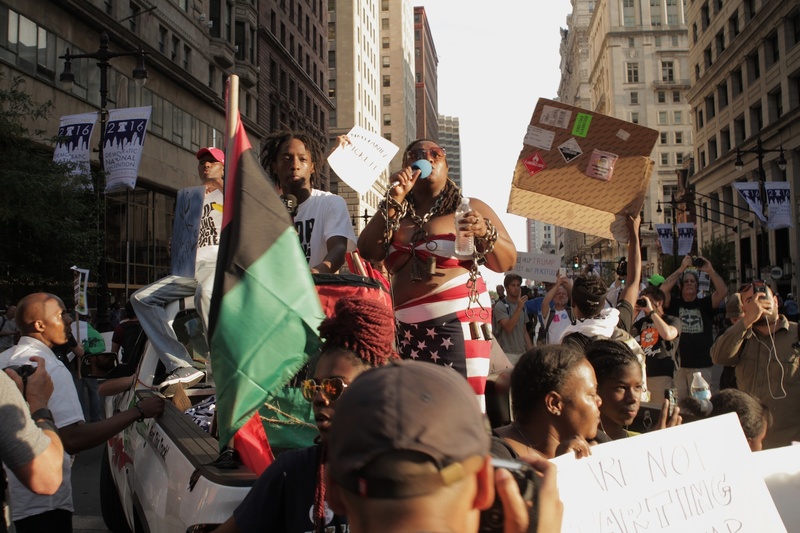 On the second day I headed to a march organized by the Philly Coalition for Real Justice – a Black Lives Matter affiliated group that formed in response to both local community issues as well as the larger cultural movement. This intense and powerful anti-police march began in the neighborhood around Temple University. Many of the organizers of the march spoke about how Temple was threatening to take their homes and their community for a football stadium. They were also upset about the police treatment of their communities. The march was decidedly anti-police, anti-Hillary, and even anti-Bernie. My original intent had been to make a 15-minute film about the whole DNC. In the end, I decided to make two longer shorts as I wanted to capture what the experience felt like, not just explain it in shorthand for others. I appreciate many of the short pieces that people put together that clearly communicate a singular message. However, I also think its important to sometimes let things play out a bit more in order to allow others to experience things for themselves. Nice work Mike. Keep documenting the REAL! !